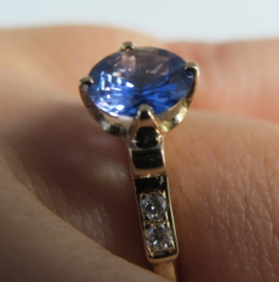 Mochiko42 shared this absolutely gorgeous sapphire engagement ring with us on the Show Me the Bling Forum at PriceScope.com. 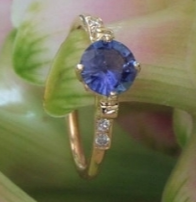 We love every reason to buy and/or wear fabulous jewelry, but the engagement ring will always hold a special place. They can be traditional and classic, or completely unique and loaded with personal flavor. 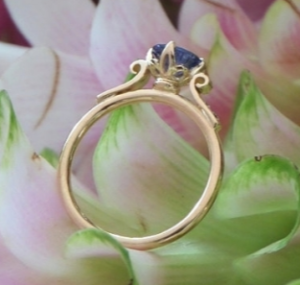 This is a Lotus engagement ring from Sally at Heart of Water. Sally also sourced the stone, and it’s stunning! I love the color shifting way that this stone captures the light. This is a wonderful marker of your lifelong commitment, I hope that you have worn it in health, wealth, and happiness in the intervening years! Thank you for sharing it with us!